The term “over-diagnosis” didn’t exist 15 years ago in the management of prostate cancer. (Well, actually it did, but it would very rarely — if ever — have come to the notice of any patient or even of the average urologist or primary care physician.) Today the term comes up all the time, but all too often it is inappropriately “interpreted” based on specific points of view. Thus, many readers may be interested in the full text article by Carter and Barratt (a medical ethicist and a public health specialist) on why they believe that the common use of this term today needs to be seen as scientifically valuable in the discussion of our changing understanding of the risks associated with diagnosis of certain types of cancer (very low- and low-risk forms of prostate cancer very specifically included). … we believe it is critical for healthcare practitioners and researchers to hold open, rigorous scientific conversations about overdiagnosis, staying focused on the central fact that overdiagnosis is correct diagnosis. The people who may cause overdiagnosis are rarely maleficent or incompetent: they are, in large part, professionals doing their job to a high standard and in the way their profession has agreed it should be done, with a desire to prevent suffering and premature death from cancer. The problem is that, within the healthcare system, standards for practice have been set at a point that may produce more harm than good. This harms individuals while appearing to help them. In other words, “over-diagnosis” is not a term that should be considered perjurative. Someone may be “over-diagnosed” for all the right reasons. The consequent issue is not the “over-diagnosis” per se. “Over-diagnosis” is neither right nor wrong. The issue is whether “over-diagnosis” could, has, or will lead to unnecessary “over-treatment” for a particular patient or group of patients.”Over-treatment” can be a very real problem. Candidly, I’d prefer not to see the word overdiagnosis in any medical literature or discussion as reasonable behavior; my preference is conservative diagnosis. To me the prefix “over-” means beyond reasonable, now the medical community expects us to accept that prefix’s meaning to be within the realm of “reasonable”? That seems unreasonable to me! It’s like the phrase, “that depends on what ‘is’ is,” used by President Clinton. (I’m being serious.) It seems an attempt to redefine a reasonable meaning of words to an Orwellian meaning. What is wrong with “conservative” diagnosis and treatment as the standard of care? In my support groups, I’ve been discussing over-diagnosis and over-treatment (not necessarily using those terms) for nearly a decade. And not just prostate cancer; also breast cancer and a host of other conditions from autism to obesity. — Those who are destined to be the most severely afflicted can certainly benefit from treatment. — Almost everyone is harmed to some extent by treatment. — In many diagnosees, the disease is destined to be so mild that it wouldn’t even have been diagnosed 50 years ago. An analogy: Suppose a new test were devised that showed you had a very good chance of developing Alzheimer’s disease by age 80, and there was a 60% effective therapy that carried a 100% chance of lowering your IQ by 10 points. Would you choose the therapy? Would you decide differently if the physician administering the test stood to gain by administering the therapy? Imagine further that this physician is not motivated by greed, but by a sincere and justified belief that they are reducing the incidence of death and debility due to Alzheimer’s, at relatively small cost to each individual. This is an area of discussion that many still won’t understand. Over-diagnosis is largely not an individual case but a cohort in a screening community. We know over-diagnosis exists but it’s hard to tell on whom it was done. Many patients that have been treated will take offense that it was possible that they were over-diagnosed. I have been aware of OD since the USPSTF grade D recommendation to stop screening (under reconsideration). Even for me it took a bit of understanding of the concept, but I do understand it well. It’s hard to summarize the resistance and grief I received at the time I was recognizing OD existed publicly. I even felt resistance from a major advocacy group leadership that I was derelict as a patient advocate by simply agreeing with the concept with some throwing a “patient bill of rights” at me saying that all patients “have a right to know about their illness”. I think we have progressed to recognize that OD exists. And it is good practice for a physician to state it before a screening takes place during the shared decision-making (SDM) process that has now been made a part of multiple clinical guidelines. Even after a diagnosis it may in many cases be worth a mention that “we found it but it’s possible we may have not needed to”. (1) It is exactly for the multiple reasons that Tony Crispino points out that I decided I needed to post the above comment on the article in question. Whether one likes the term or not is not going to be the issue. It is a term that has a very specific meaning to the public health and epidemiology community. And so we are just going to be seeing it a lot (and not only in relation to the management of prostate cancer; low-risk forms of thyroid cancer, breast cancer, and some other forms of low-risk cancer are also commonly “over-diagnosed”). This is an area of real science. It’s hard (I believe) to over-diagnose (or “conservatively diagnose”), leading to treatment, pancreatic cancer, for example. Not impossible: I know of an 82-year-old who might have been over-diagnosed, at least on the basis that she refused treatment and is doing fine. But hard. But we can all agree that it is possible in prostate cancer and of course that is true elsewhere. My view of the human body is that it is like a Glasgow bar: if you go in looking for trouble, you are going to find it. 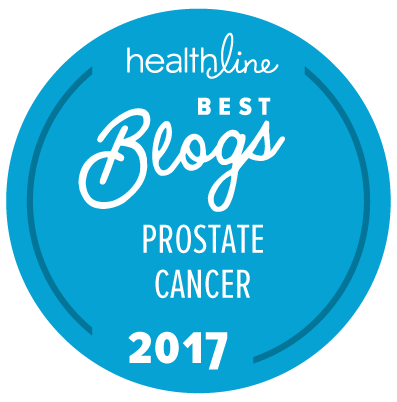 Prostate cancer is a key battleground because of the risk of harms that will be weighed very differently by different people. (I love analogies, but the 10 IQ point drop is an over-simplification: sorry, “conservative simplification”). I am on the front line but over the last 4 years I have found that doctors are much more sympathetic on this issue. I have observed (obviously not a significant test, except to me) a move away from “Cut it out, boy!” to “Well you seem to understand the issues and as long as you truly realize just how nasty the advanced forms are, it’s your body”. As I sit just to the black side of grey in Klotz’s slide I truly believe momentum is still on my side; the body count is still not there, even for the reduced levels off treatment that are increasingly the norm post-diagnosis. Some (or a lot) of the literature still tails off into a story that “There seems to be something different about screen-detected cancers”. That is deeply unsatisfactory and suggests that there is a lot more science to be done. And another dirty little secret in this debate is the forgotten and most interesting cohort of the ProtecT trial; the men who were too ill to randomize ethically and of course all of whom were offered treatment. They are not dying either (in the numbers expected), which is the best news of all. Click here for the ProtecT advanced cohort paper.